Why, with The Cooking Oil Comparison Chart, of course! I’ve teamed up with Andy Bellatti, MS, RD, to help answer these questions with this chart. (If you don’t already follow Andy, you’re missing out.) 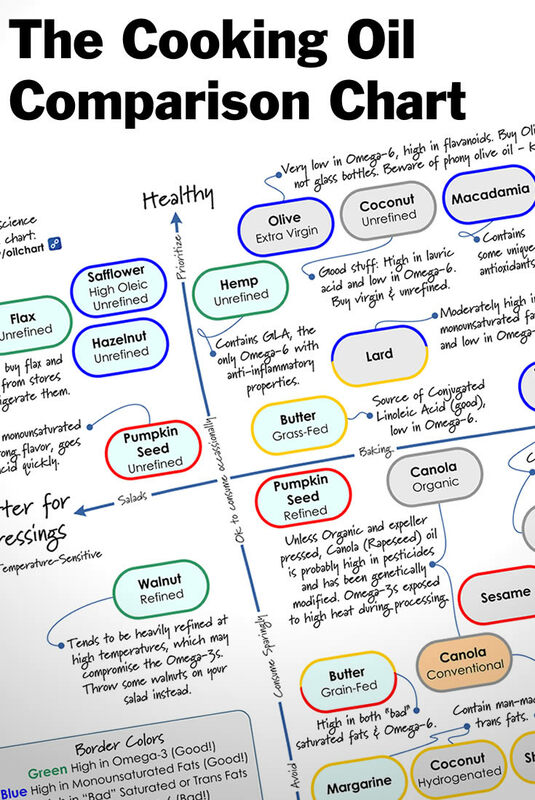 We’ve created a one-page, printable PDF that you can take with you to the grocery story (or stick up on your fridge), that will help guide you through the labyrinth of oils. We focused on two main factors, healthfulness and temperature-sensitivity, since some oils lose their health benefits when heated. 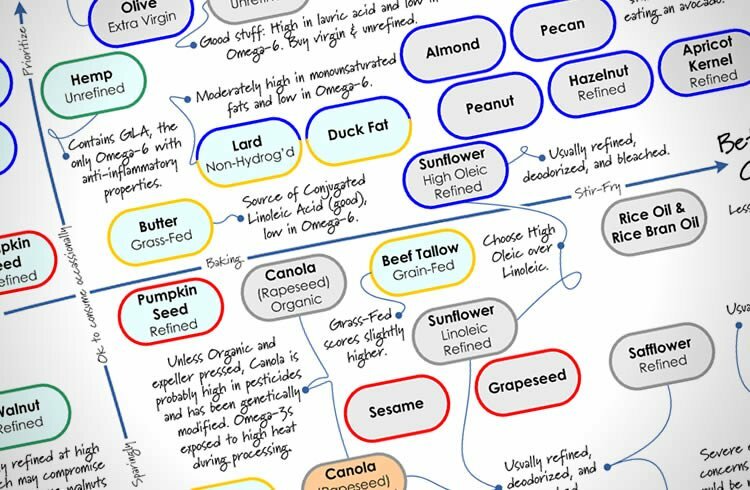 Using a grid that makes it easy to see where each oil falls on the spectrum, you’ll be able to tell at a glance which oils to use for your salad, and which to use for your next stir-fry — and which oils to avoid altogether. We’ve also included some secondary details about each oil, along with some important pitfalls to watch out for. Andy has written a post on his blog explaining the science behind our oil comparisons, so you’ll know why each oil is where it is on the chart. So click on over to Andy’s post to get the nitty-gritty, and then come back here and get the PDF. If you’d like to share this chart on your own website or blog, please be respectful (and law-abiding) and share it simply by linking directly to this post. 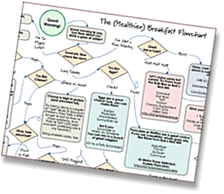 Please do not link directly to the PDF or copy the entire chart to your own site. You may use the image at the top of this post on your own page, if you like. Thanks! PS – Huge thanks to Andy for jumping on board when I proposed this project to him. I had a ton of fun collaborating with him, and appreciate his enthusiasm and expertise! Love that this chart highlights the issue of Omega-3 to Omega-6 ratio, as it’s not that well-known. I mostly use olive and high-oleic safflower oils, and avocado or macadamia nut when I have lots of extra cash (ha). My cardiologist says many of the studies about cocounut oil are funded by the coconut industry, so I’m still wary of its saturated fat content. But I get that for most healthy people, it’s a great oil. Wondering why organic, expeller-pressed canola isn’t higher on the healthy scale here. Thanks for another amazing chart, Andrew! Most canola oil, even Organic and expeller-pressed, has been refined. The heat in the refining process damages the Omega-3s. I did just find one Organic, Expeller-Pressed, Unrefined Canola Oil online — though they encourage cooking and sauteeing, which also will damage the Omega-3s. Also, expeller-pressing, while better than conventional extraction that uses hexane, can actually generate quite a bit of heat. Moreover, I’m pretty sure there isn’t a strict definition for “cold-pressed” — so the oils may actually get pretty hot in the process. Great chart. One question. I see that palm and palm kernel oil is at the bottom of the chart, and thus generally to be avoided. But I’ve read conflicting information in recent weeks regarding these oils. In particular, the paleo crowd (e.g., Mark Sisson, the authors of the Perfect Health Diet) assert that palm oil (and perhaps palm kernel oil) is healthy. Would love to hear your response on this. Thank you! Hi Trey! Clarifying butter removes the milk solids and leaves the fats in place, so it shouldn’t have much of an impact of the fat composition. So we think that it would score in the same spots on the chart. With Palm Oil, environmental concerns aside, there isn’t much nutritional benefit with it that you can’t get elsewhere…and then you run into the refined/deodorized/bleached issues. Great chart! I’m printing it out right now. I just have a few questions about the Red Palm Oil. Environmental impact aside, I wondered about the nutritional impact. Isn’t there a difference between hydrogenated/deodorized/bleached “Palm Oil” and the virgin, unrefined stuff that Tropical Traditions, Wilderness Family Naturals or Jungle Products carries? And when you say there isn’t much nutritional benefit, do you think the amounts of Vitamin E and COQ10 are insignificant? There’s a red border around Palm and Kernel Oil, but the only sources I can find say that palm oils are mostly saturated with very little PUFAs. Thanks for doing this, Andrew! Clearly it took a lot of work, but I love how it is all boiled down into a very easy-to-read format. This one’s getting pinned up on the refrigerator! Hi Andrew, One thing I maybe missed was the effect that high heat levels have on oils. That’s important because from what I understand, taking an oil over the smoke point completely changes it and suddenly something that was healthy is now totally unhealthy. Did I miss that somewhere? So for frying you would NOT want to use avocado oil. I have to admit I’m a little confused by the diagram. I get cooking oils are on the far right but I saw avocado oil over there. Hi Annette. We didn’t specifically address what happens after you pass the smoke point, but the oils are generally sorted from low to high as you move from left to right. Avocado Oil has one of the highest smoke points (actually I think it’s the highest) of any oil on the chart — 520 Fahrenheit — which is why it’s all the way over on the right.